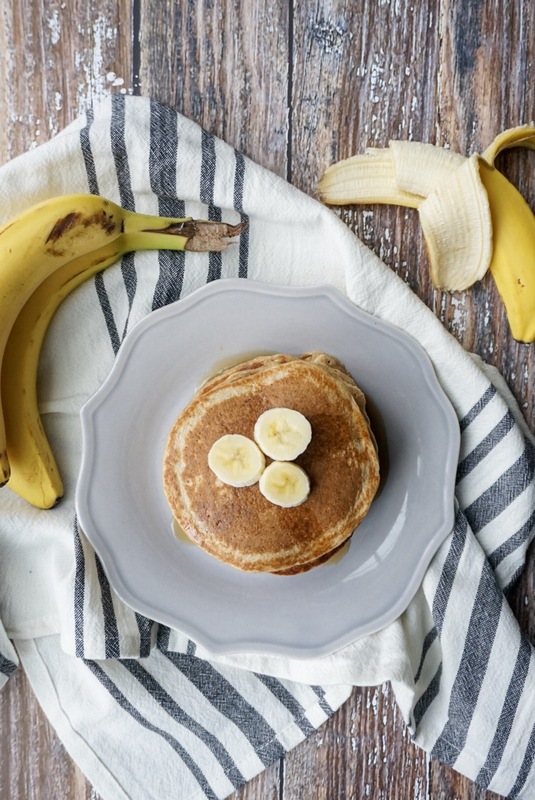 Breakfast just got easier with these Banana Oatmeal Blender Pancakes. Just combine all the ingredients in a blender then cook pancakes in a skillet to enjoy a healthy and delicious breakfast. Anyone else find themselves needing two breakfasts during the work week? Well I sure do, I have a green smoothie with Protein or Collagen (<- check out my favs) post workout around 7:00 a.m. every morning. But then a few hours later I’m hungry again and need to eat something more filling. Usually I’m a huge fan of warm oatmeal for breakfast, hello my Power Oatmeal that I eat almost every day. But every so often I like to change-up my morning routine and eat something different. 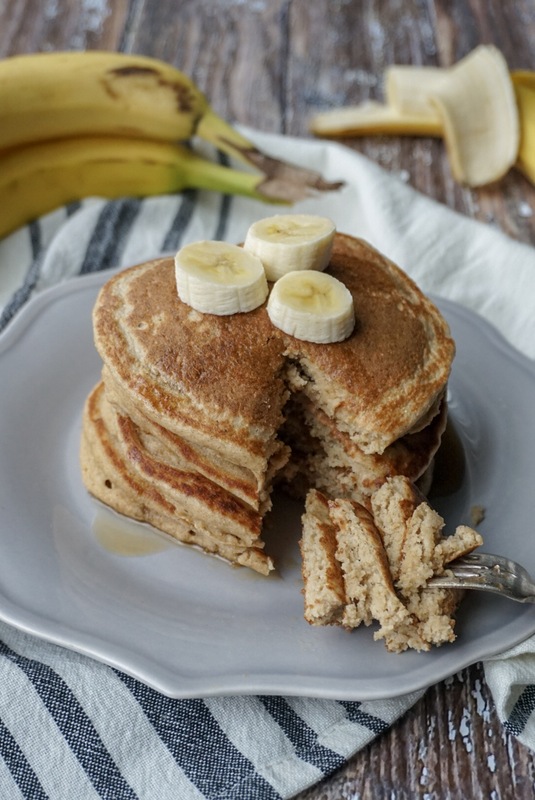 These Banana Oatmeal Blender Pancakes are so easy because all the ingredients are just combined in a blender. They can be made quickly in the morning or ahead of time and re-heated throughout the week. Since you’re making the batter yourself you don’t need to worry about artificial preservatives and ingredients from store-bought baking mixes, I’m looking at you Bisquick. I use oatmeal instead of white flour in my pancakes because of the health benefits of eating oats. Oats are high in fiber, which will help keep you fuller longer opposed to white flour. 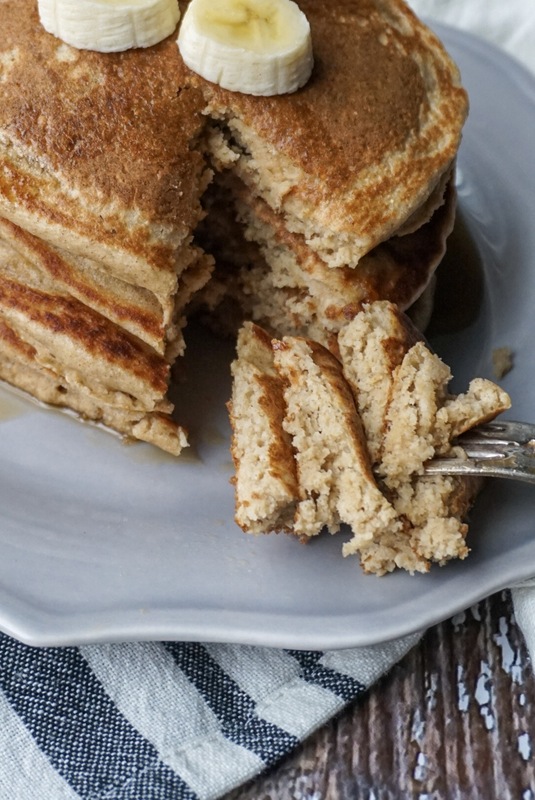 The oats easily ground up in the blender so you still get a fluffy and delicious pancake. I also like that you can also buy oats gluten-free, I used Bob’s Red Mill Gluten Free Oats in this recipe. I don’t eat a strict gluten-free diet, but I find that there has been enough research showing it’s a substance we should eat limited amounts of. Typical pancake recipes will also call for sugar and oil. 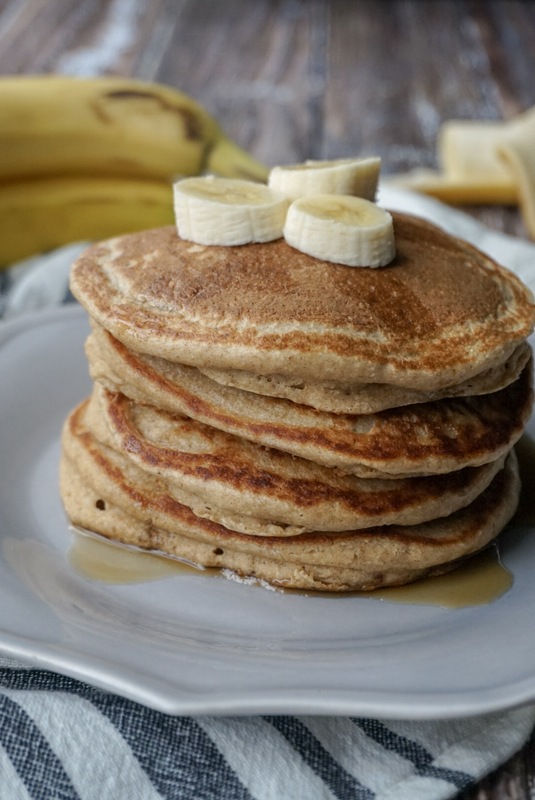 In this recipe I use the sweetness of the ripe banana plus a little maple syrup and find that you really don’t need to replace the oil, I just leave it out and use coconut oil or non-spray for the pan when ready to cook. 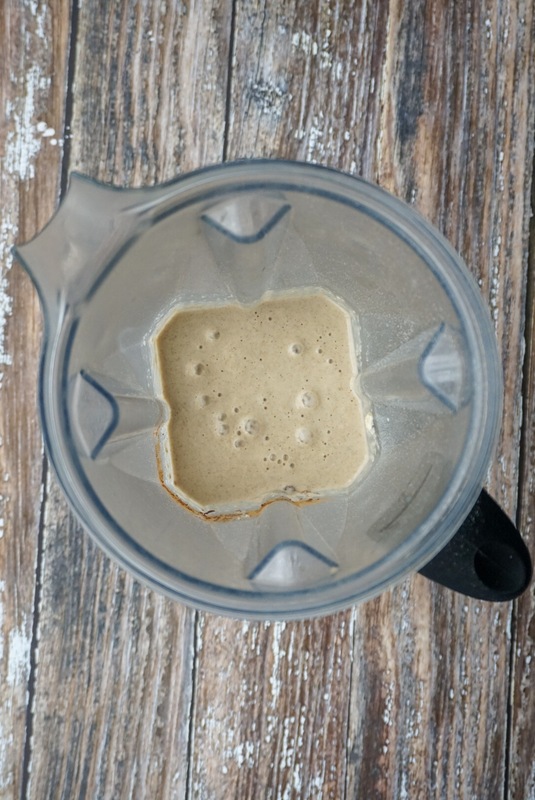 To make the pancakes simply combine all the ingredients in a high-powered blender, I use a Vitamix. It only takes a few seconds for the oats to ground and the wet and dry ingredients to combine. Now you don’t HAVE to use a blender. Feel free to whisk all the ingredients together in a mixing bowl. Your pancakes will have a different texture though if the oats aren’t ground up. To cook the pancakes heat a non-stick skillet over medium heat with some coconut oil or cooking spray. I keep the batter in the blender and pour it into the skillet until about a 5 inch circle pancake forms. Cook a minute or two, until large bubbles appear on the surface then flip and cook for an additional few minutes. Now for the toppings, there are so many pancake toppings besides just adding butter and syrup to explore. 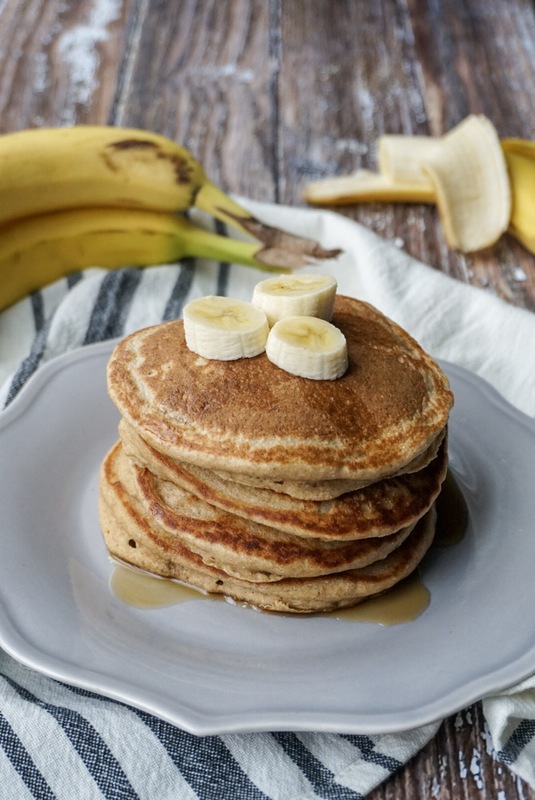 Personally I love topping my stack with a few slices of banana and some nut butter, and occasionally a little extra maple syrup. You could also top with other fruit, peanut butter, sliced almonds, or even granola. Pancakes were one of my favorite breakfast meals growing up, but we typically only had them on the weekends. I love making this recipe during my weekly meal prep and then eating two pancakes for breakfast throughout the week. Enjoy! 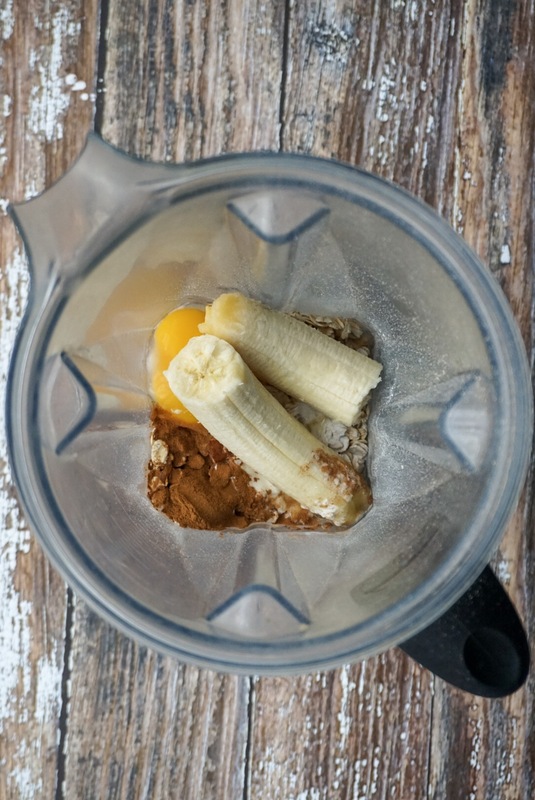 Place the oats, milk, banana, egg, baking powder, cinnamon, and maple syrup in a blender and blend until smooth. Grease a pan or griddle with coconut oil or non-stick cooking spray and place over medium heat. Pour in about ⅓ a cup of batter and cook 2-3 minutes or until large bubble begin to pop. Flip and cook for an additional 1-2 minutes. Repeat with the remaining batter. Should make about 8 pancakes. Serve with banana slices, maple syrup, nuts, nut butter, etc. Sweet or Savory for breakfast? Tell me something delicious you’ve eaten recently. Yum, I totally wish I had time for pancakes this am! I can’t believe how easy these are!! Pancakes are always a hit! Right, I love how easy it is to throw everything into the blender! Yum, so many good combos. I wish I made them more often, pancakes are probably my favorite breakfast!